temporary license tags — those paper license plates issued by auto dealers to car buyers. The sponsor of a new state law taking effect Aug. 28 hopes it helps deal with the problem. 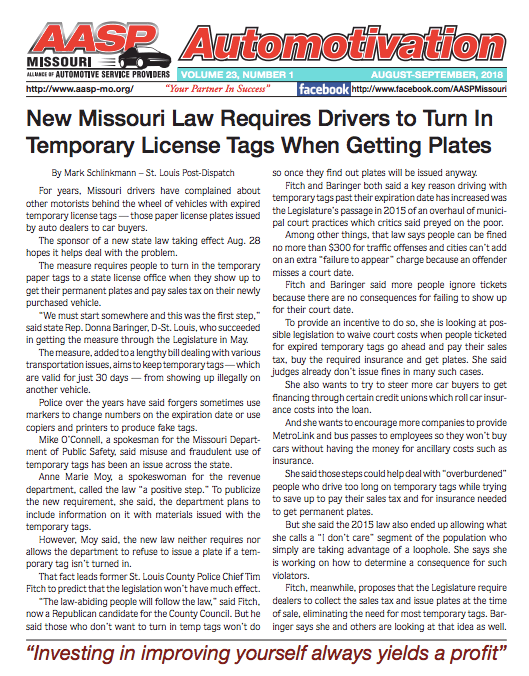 The measure requires people to turn in the temporary paper tags to a state license office when they show up to get their permanent plates and pay sales tax on their newly purchased vehicle. The measure, added to a lengthy bill dealing with various transportation issues, aims to keep temporary tags — which are valid for just 30 days — from showing up illegally on another vehicle. Police over the years have said forgers sometimes use markers to change numbers on the expiration date or use copiers and printers to produce fake tags.